At Safety Fabrications, bespoke fabrications are fabrications custom built to our clients specifications. We are often called upon to provide a bespoke solution for a customer and find that we are able to apply a lot of our techniques and knowledge gained from producing our standard products such as a plant platform or safety ladders in order to achieve this bespoke solution. This Gantry was designed by one of our customers to provide the end-user collective protection whilst working at height in line with the Work at Height Regulations (2005). The Gantry is fabricated from aluminium section and is complete with guardrail to all exposed sides. 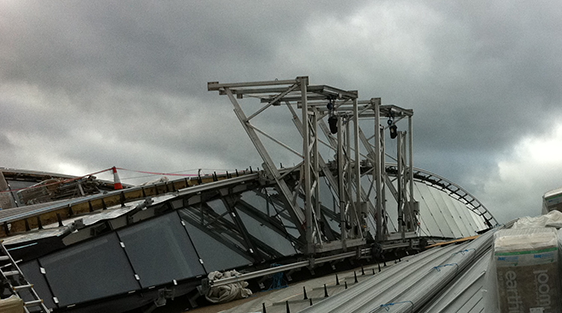 The gantry itself runs on a pair of rails and can provide access to the soffit of the roof along its length. This piece of the plant platform was complete with handrails to both sides was designed by our customer to provide access across a short expanse of atrium glazed roof. The client did not want the walkway to permanently obscure the glazing so it was affixed to a set of rails which allowed it to be “parked” off the glass when not in use. Our products such as this plant platform are all bespoke fabrications tailored to your. The client required a ladder that would not be visible except when it was in use. The solution – a ladder that is raised using a winch mechanism – see the video to see the invisible ladder in action! Our customer undertakes a lot of maintenance works on the Gas Turbines within Power Stations. These are dirty, dark and dangerous environments and he identified the need to improve both the fall protection and luminescence for his workers. The solution a temporary overhead rig that can be installed by crane, the rig to encompass both a pair of fall protection systems, task lighting and 110v power points. The Working at Height Regulations WAHR 2005 brought to the fore the hazards many workers outside the construction industry are exposed to when working at height. One sector of industry where there was found to be high risk is the haulage sector. Our client a bulk haulage importer identified a fall hazard to drivers dipping their tanker pots at loading bays – typically the driver would climb onto the back of the tanker to remove the tank lid and to dip it to check content level prior to filling. Unprotected this was not an acceptable level of risk to be exposing the drivers to. The solution was to provide a series of overhead fall protection systems at each of their loading depots across the UK. We worked closely with the customer to fabricate the large davit arm structures which were subsequently fitted with cable based fall protection systems. Our client manufactures well head caps for export across the globe. A fall hazard exists for engineers both during the final construction stage of the well head prior to it leaving the workshop and during its initial commissioning phase at the oil well. We worked with the customer to produce a removable davit which could be packaged with the well head prior to shipment. In essence we pride ourselves on working with our customers to develop solutions for their access and safety needs.